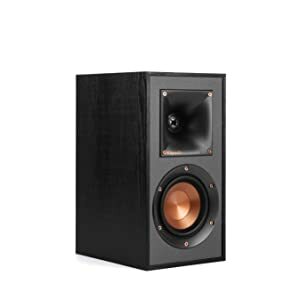 Design Reinforced MDF construction reduces cabinet vibration for less audible coloration and improved sonic accuracy. 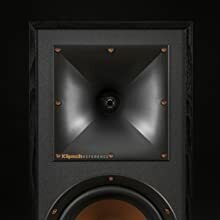 Klipsch exclusive 90x90º Tractrix horn technology ensures that the speaker high frequency energy is aimed at the listener and reduces artificial reverb or filtering caused by indirect sound bouncing off of walls. Using this proprietary focused technology gives you the clarity, dynamics, and detail from your movies and music. 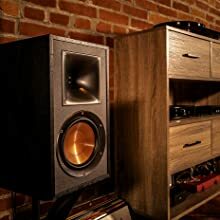 Klipsch exclusive Linear Travel Suspension (LTS) aluminum tweeter minimizes distortion for enhanced, detailed performances. Using Kapton, an extremely light and rigid material, in the tweeter suspension provides high efficiency and improve resolution and detail. 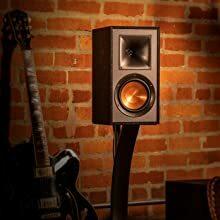 LTS tweeters are a hallmark of Klipsch speakers, making them some of the speakers in the world. Injection Molded Graphite (IMG) woofer cones are exceptionally light while being extremely rigid – providing remarkable low frequency response, with minimal cone breakup and distortion. 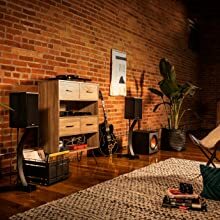 When paired with the Tractrix Horn-Loaded LTS Tweeter, it provides speaker efficiency high in its class.